"When you get a diagnosis, you need to have a plan." COLUMBIA 4/20/15 (Beat Byte) -- "Ya did it, kid." 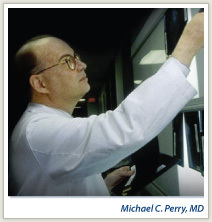 On those four words, Michael Perry, M.D. smiled and leaned forward and gently kissed my wife on her forehead. It was the end of an 18 month journey that started with a heart-sinking fear we had to confront head on. Dr. Perry's wisdom -- delivered in brief, deliberated teachings, through a gentle-gruff demeanor -- started us confronting it from the day we got the news. My wife had an aggressive form of breast cancer that doubled in size in a matter of weeks. It would kill her if we didn't act quickly. "When you get a diagnosis, you need to have a plan," Dr. Perry told us on diagnosis day. And he already had the plan in his hand. Dr. Perry died in 2011, and a new University of Missouri School of Medicine Fellowship that honors his legacy begins next month with a fundraiser at his longtime professional home, the Ellis Fischel Cancer Center. "Ellis needs to be recognized for what it is," Perry said. "A place where people come to ensure a long and healthy life." Perry's team at Ellis saved my wife's life with a combination of the latest treatments and a philosophy that turned the conventional wisdom about cancer on its head. Where we had always heard cancer was a battle, and that patients "fought cancer" to live, Perry believed it was instead a calm, deliberative management project. Think about it. You get a life-threatening diagnosis that requires immediate action and strict adherence to treatments that -- in my wife's case -- took nearly two years to complete. Would you and your family be more ready, willing, and able to approach it as a war or as a management plan? To Mike Perry, the answer was obvious. Cancer isn't something to battle. You can lose a battle. Cancer is something to manage. You can't lose a management. Loss was not part of Perry's plan. With a cool demeanor punctuated by wry jokes, Dr. Perry never raised his voice or betrayed a hint of pessimism. He never seemed worried. He avoided drama. Where Alison and I might have gotten lost in the fog of "hope and pray," Perry saw through the fog, with an attitude more like "pray and know." Hope may spring eternal, but knowing is certain, and certainty -- or at least, a certain demeanor -- makes all the difference when you're facing the possibility of death. Dr. Perry was all about certainty. He didn't hope chemotherapy, and radiation, and surgery would work. He knew it would. As a patient and her husband and her children, we couldn't get any better than that. "And you haven't even met Taxol," she exclaimed, referring to the next drug in our long chemotherapy journey. We realized certainty with every follow-up visit, when we would hold our breath, keep our heads down, squeeze each other's hands and pray -- as Mary, or an oncology fellow, or Dr. Perry would palpate the danger zones, feeling around for any signs of tumor recurrence. We're spiritual folks and I remember thinking how much easier it probably was for the Man Upstairs to hear our prayers without the din of battle or the guns of war, but rather, with such quiet calm. When he sensed fear or worry, Dr. Perry kept us calm by openly wondering what on Earth we were worried about. The cancer is gone -- he was certain. Nothing gives you courage to face the darkness like certainty light is at the end. When the tumor vanished completely, not a trace to be found, we saw the light Dr. Perry had seen all along. Six years later, the light is still shining. "Wanna miracle?" I heard the Man Upstairs say. "I give you medical science -- and Michael Perry."